Transportation Costs > How Much Does a Four Wheeler Cost? How Much Does a Four Wheeler Cost? ATVs can come with three wheels or four wheels. A four wheeler is widely used by drivers who enjoy off-road driving on dirt trails, steep slopes, and even streams. Four wheelers are also used by extreme sports enthusiasts, who race and compete with these ATVs. On average, a four wheeler can cost anywhere from as little as $500 used to as much as $10,000 new. Most purchases, though, are going to be between the $2,000 and $5,000 price range. A smaller child-sized four wheeler, for example, can cost $1,000 to $2,500, while an adult-sized model can cost upwards of $10,000. ATVTraderOnline.com, a popular four wheeler classified ad-based website, has newer models from the current year starting at $5,000. ArcheryTalk.com features a conversation about the four wheelers that people used when hunting, and most of them claimed that they paid anywhere from $2,000 to $8,000. Refer to our table below to see what the average cost of popular four wheel brands. With so many models with each brand, we took the average new MSRP price. If you purchase a four wheeler online, especially if purchasing used, some may require a shipping and handling fee. You might also want to pay for insurance coverage when it’s being shipped. Like a car, you’re going to want to have your four wheeler insured. Insurance rates will vary on your age, the four wheeler you’re driving, where you live and how much you plan on using it. Plan on budgeting about $200 a year. If you want to tow your four wheeler, an additional trailer will be needed. To customize your four wheeler, it’s going to cost you more. Your own choice of wheels could range anywhere from $800 to $1,000. Plan on unnecessary repairs or maintenance down the road such as oil changes, etc. If you are purchasing a four wheeler for races and competitions, you will need to ensure that you specify this to the salesman as you need to buy one that is made for this purpose. 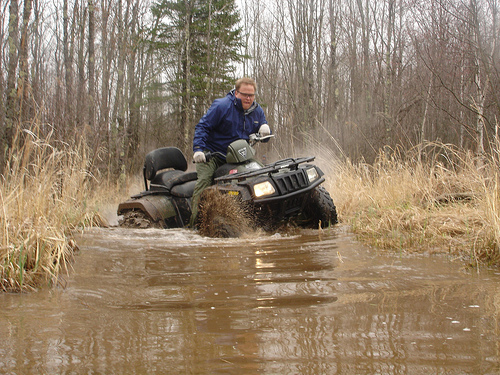 For example, a four wheeler made for extreme sports will have a more complex shock system to absorb the shock when the ATV lands after a jump. If you are purchasing a used four wheeler, ask the previous owner about the warranty. Some companies will allow the warranty to be transferred to the new owner. Most new four wheelers will come with some type of limited warranty, and this will depend on the brand. Does your company offer free maintenance? Are there any free accessories included? Does the company offer a warranty for the four wheeler? There are plenty of second-hand four wheelers on the market if you are on a tight budget. Like a car, you could save up to 50 percent. Check out auctions. There are several four wheeler owners willing to auction off their four wheeler. There are ATV clubs and organizations everywhere. Ask their opinion when it comes to buying a four wheeler. They are most likely to suggest an ATV worth your money. Many dealers offer to finance. If you cannot afford the up front payments, consider seeing what options are available out there.